It is the aim of the project PROPER CHANCE– Implementing ECVET in the field of health and social care for the promotion of professional permeability and geographical mobility" to support professional permeability and mobility for workers in the field of health and social care by promoting the use of ECVET. 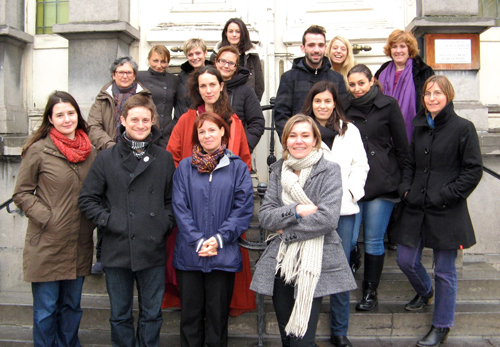 Together with project partners from Belgium and Italy, AFBB will work on the achievement of these aims during the 2-year project period from October 2011 till September 2013. The first project meeting of all partners took place in Brussels in November 2011. As a foundation for the future common project work, similarities and differences of the vocational education systems in the participating countries were discussed. Professions in the field of health and social care, which are to be compared during project work, were presented. Project which transferred the results of the Belgian project "Thésée" to Italy and France, focusing on ECVET instruments and principles and professions which are included in PROPER CHANCE as well. - The German partners presented the pilot initiative DECVET, which focuses on the sector of business administration, and which tested the implementation of ECVET instruments and principles as well as permeability between full-time and dual vocational education and training. These experiences made by the project participants will be shared and will influence the project work for "PROPER CHANCE". On this basis, the methodology for the description of units of learning outcomes according to the recommendation of the European parliament and of the Council on the establishment of a European Credit System for Vocational Education and Training (ECVET) has been discussed. The agreement on the methodology for description is essential for achieving the first aim of the project: Units of learning outcomes of all in all nine professions from Germany, Italy and Belgium. The results of this work will be discussed during the next project meeting in Dresden in August.